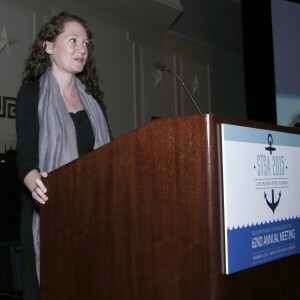 Emily Downs, MD accepted her 2015 Hawley Seiler Residents Award at the November 2015 STSA Annual Meeting in Orlando. Residents are invited to submit abstracts for the STSA 63rd Annual Meeting and participate in the 2016 Hawley Seiler Residents Award Competition. Named for STSA Past President and Founder, Hawley H. Seiler, MD, this award is presented annually to the resident who most excels in their manuscript and oral presentation at the STSA Annual Meeting. The 2016 Hawley Seiler Residents Award winner will receive $500, a personalized plaque, and their name will be engraved on a permanent plaque to be displayed at future STSA Annual Meetings. The winner will be announced at the 2016 Annual Awards Dinner & Dance. Residents participating in the competition are eligible for reduced-price tickets to attend this event. Learn about the Hawley Seiler Residents Award and view a list of past recipients. Access the STSA 63rd Annual Meeting abstract submission site. To enter the competition, accept the decision to participate in the awards program in Step 3. Read more about Dr. Bott’s experience presenting and moderating at the 61st Annual Meeting. The deadline to submit abstracts is April 4, 2016, 11:59 pm, ET. For technical questions regarding submissions, e-mail Technical Support at ts.acsupport@thomson.com or call (434) 964-4100. Technical Support is available Monday-Friday from 8:30 a.m. to 8:30 p.m., ET. For non-technical questions regarding submissions, e-mail STSA at stsa@stsa.org or call (312) 202-5892.